THE chickens seen in the photo at the left may look just like any brood of infant barnyard fowl but that is because Modern Mechanix couldn’t print them in colors. In the flesh, however, they are a deep pink in hue with bills and toe nails a resplendent rose color. The chicks were produced during experiments in which the mother was fed red dye. Further experiments are under way with other dyes and soon purple and green hens may be as common as white and brown ones now. The chickens otherwise are normal in every respect. So why include the photo at all? Was it organic red dye? By the way… Why would anyone would ask something like: “For me the roasted pink chicken please” ?? 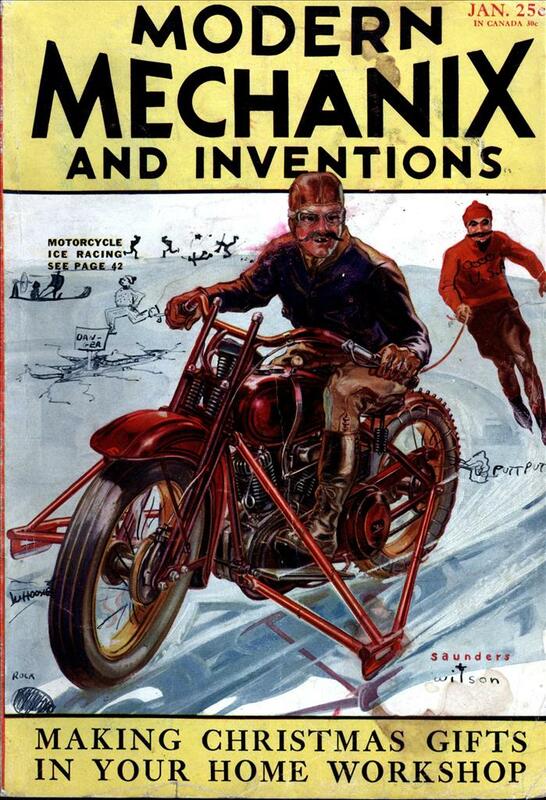 jayessell: That’s exactly what they used to be for, actually. Colored Easter chicks. 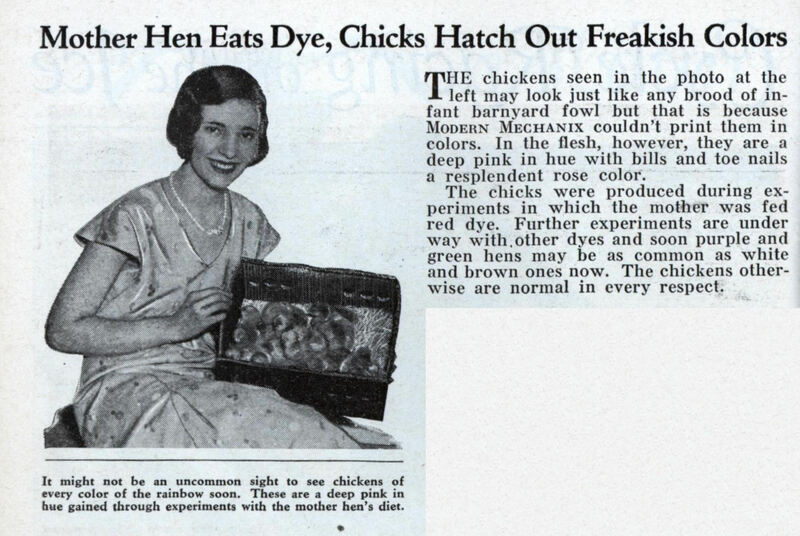 Though, I’m pretty sure that they started simply dipping the chicks in dye. I think. Either way, can’t be good for the chicken. if you cross bred a red and a blue one ……. Hi my name is Nichelle and i have a poem to say about the chicks. Voilets are red roses are blue these chicks are as beatuful as u mother hen. Nowadays the colourant is injected into the egg a day or so before the chick hatches. If all goes well the albumen is blue (or whatever colour) and the chicks entire bodies are drenched in blue food colouring and the hatched chick remains completely blue untill new feathers begin to grow in their natural colour. Many chicks die from infection entering the breached egg or from the die being injected into their bodies. I wonder if the dye stings eyes and affects eyesight, what a stupid practice. Feeding food colour to hens seems less harmful overall. Many magicians mix food colour and water in a spray bottle and soak their doves, this seems less harmfull still than injecting and ingesting but it is uneccissary.